How is it September already???! August is usually sllllooooow for me because of the endless heat, lack of days off/holidays, and I'm usually not traveling anywhere. Some people get seasonal affective disorder (SAD) during the winter, but mine usually hits in the summer. Still, when you've got this little guy crawling around everywhere, I can see how the days would go by so quickly. 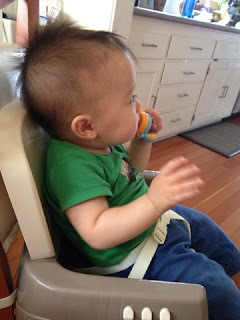 I recently decided to get him a little self-feeder (this one is KidsMe) because he's taken interest in eating stuff that I eat, and he hasn't figured out the hand-to-mouth thing. It buys me some extra minutes to wash bottles, clean, and prepare food. Speaking of preparing food, I can't WAIT until this heat dies down. Especially because we're part of the air conditioning cycling program that shuts off the AC riiiiight when the heat is the worst. I am pretty sure this counts as a sauna visit. I really want to turn on the oven again. I feel like most of the cooking I do involves an oven. 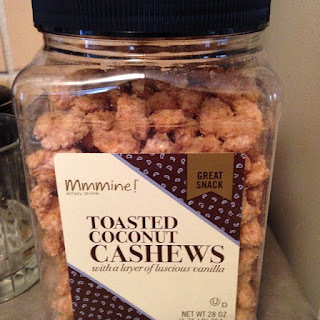 Recently, I decided to start eating lactation-promoting foods again. My freezer stash is probably going to be gone soon, I'm only pumping about 75% of what I was during my first few months back at work, and Baby Tuesday is still pretty much drinking 100% of everything in spite of all the food he eats. He recently had his 9-month checkup, and he's just under 20 pounds (50th percentile), 80th percentile in height (so we had to switch him to a convertible car seat). He drinks a little formula, and I suspect that will need to go up a bit even though I feel like it's juussst a few months until he can have regular milk. Hence, these balls. 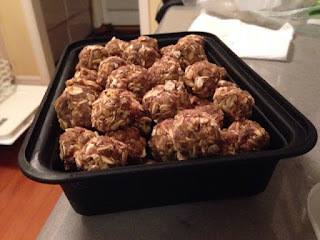 I basically threw in two cups of oats, a cup of peanut butter, a cup of honey, a cup of ground flax, and half a cup of brewer's yeast, along with a chopped-up chocolate bar, a splash of vanilla, and some toasted coconut that fell to the bottom of a coconut cashew container. A little coconut oil and almond milk helped get it moist enough to roll into (many) balls. Unfortunately, I really need to get debittered brewer's yeast, because it's a little rough-tasting using the regular kind. Now, I can't really say whether these or the tea that I drink are helping, as some days turn out better than others for no known reason. Since my pumping output is not great anyway, I'm in the process of trying to cut down a pump session at work (by shortening the length and then shifting the times), and just going longer twice a day in addition to the before-bed session. I definitely want to be down to one session when Baby Tuesday is one and stop pumping during the day shortly afterward, so I'm giving myself plenty of time to adjust but still hoping to give him as much as I can. Here's hoping my (second) pump doesn't die before then. Ooops, that was too much breastfeeding talk! As you can tell, it dominates my life. In fitness news, I've been pretty good about working out 4-5 times a week, and more recently, I've been able to run 4 miles instead of 3.1 on the days that I run. I usually finish it in about 37 minutes, though if I'm running around my neighborhood, it's a bit longer due to hills and traffic lights. I want to work up to longer distances, but at this point, I'm not sure how far. I registered a 10K in February but don't know if I will drop to the 5k (if I am pushing the stroller) or what. Also, my knees have started to give me a little trouble again, and I don't know if it's just because I'm "new" again or because I haven't taken my glucosamine supplements since I got pregnant. Running + plyo (Insanity and Insanity Max 30... review is coming soon) is not a good combo. On September 25th, I am doing the YMCA Stair Climb again. I've been using the stair machine at the gym once a week for about 20 minutes at a time, so that the machine registers 100+ floors (the climb is 75 floors). It will be interesting to see how I do since I didn't really train at all last time and was just more fit to begin with, and at least it's a low-impact activity. Lol at "some toasted coconut that fell to the bottom of a coconut cashew container"! That's clever. I know a lot of people complain about the taste of brewer's yeast. I've never tried it in lactation cookies, but I do really actually like Marmite and now I'm wondering where I can find some in this country! You are a champ for continuing breastfeeding! It isn't the easiest journey, that's for sure. Great job on your fitness. 30 halves is amazing!